In the British and Irish metrication processes, the pint was replaced by metric units as the legally defined primary unit of measure for trading by volume or capacity, except for the sale of draught beer and cider, and milk in returnable containers. The pint can still be used in those countries as a supplementary unit in all circumstances. Legislation in the UK mandates the use of the pint as a measure for draught beer and cider (in pubs for instance). For milk, if returnable containers are used, the pint can still be the principal unit used, otherwise metric units (usually the non-SI litre) must be used. There is no requirement for the litre quantity to be round numbers: thus the quantity of milk sold in a non-returnable container may be 1 pint, but will have "568 ml 1��pint", or just "568 ml" on the label. 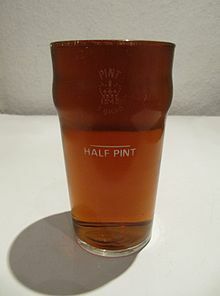 Many recipes published in the UK and Ireland still give ingredient quantities in imperial, where the pint is often used as a unit for larger liquid quantities. The Guild of Food Writers recommends that new recipes be published in metric units.